← Move over extremism, moderation is creeping on! 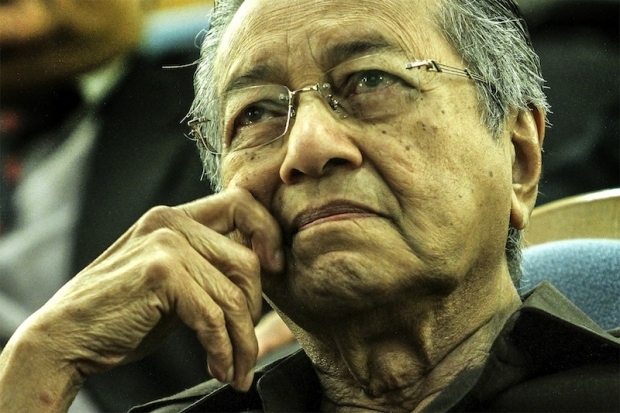 KUALA LUMPUR, July 13 — Finally acknowledging he is in his twilight years, Tun Dr Mahathir Mohamad lamented today in a poem how Malay leaders have sold off their honour for temporal wealth and wondered if the once proud race would return to their former glory. The former prime minister, who just turned 90 on July 10, said in his poem written in Bahasa Malaysia that the Malays used to possess strength and a steely spirit, but they were later consumed with greed and desire. “The independent race, the honourable race, now are willing to sell some of their rights, the right to choose and the right to vote, to get comfort without effort, just a little comfort,” Dr Mahathir wrote on his blog in a poem titled “Malaysia Tanahair-Ku” (Malaysia, my land). “Will my race return? Or will it become a race that is colonised, humiliated and enslaved? Oh my race, have you forgotten so easily? I will go soon. Can I close my eyes and breathe my last because my race, my country, is still honourable, still regarded highly? Or will I blink, my breath coming out in gasps, stopping, because everything we have fought for is swallowed by lust,” he said. Dr Mahathir also said the politics that “once saved” have become the “politics that destroy”. “Leaders are getting greedier for place and position. What was once ‘haram’ has been made ‘halal’. The name of Allah has been abused, sold for temporal wealth in the world,” he said. Dr Mahathir reportedly said Friday that he had never expected to celebrate his 90th birthday, but expressed his desire to continue helping the nation he had led for over two decades. The elder Umno politician has been pushing openly for Prime Minister Datuk Seri Najib Razak’s resignation, citing the controversy surrounding debt-laden 1 Malaysia Development Berhad (1MDB).